FAQ: Is one biomass calibration function valid for different SFR vario devices running with the same biological system under the same conditions? 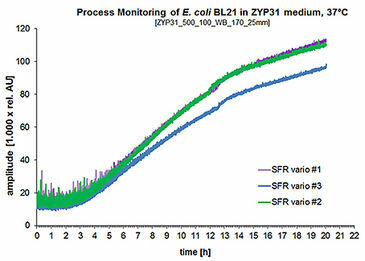 In the figure on the left parallel measurement of E. coli BL21 culture in ZYP31 medium at 37 °C on 3 SFR vario devices is depicted. The cultivations were carried out in 500 mL shake flasks with 100 mL working volume at 170 rpm, and 25 mm shaking diameter. The amplitude measurements show, that different SFR vario devices show the same curve shape in biomass measurement when operated with the same biological system; measurements of device #1 and #2 are almost identical. 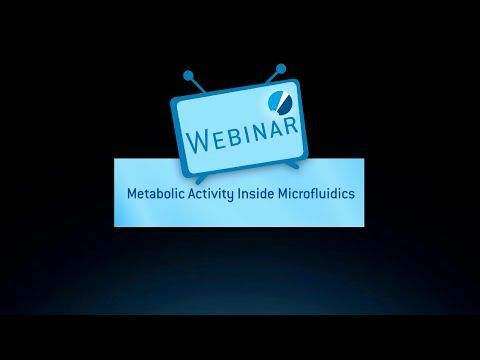 In all graphs a small kink is visible, where the main substrate glycerine was completely consumed, and a metabolic shift to consuming other substrate took place. The blue graph recorded with SFR vario device #3 lies a little lower than the others, and even the metabolic shift took place later than in the other two cultures, so this is not a measurement variation caused by the SFR vario, but this culture was simply growing slower than the others. When comparing the online measured data with offline optical density measurements it turned out, this culture also showed lower optical density than the others after a cultivation period of 22 hours.